You don’t need any professional instruction when you start jogging or cycling. But weight training is an entirely different ball game. Many questions come to your mind when you are starting weight training after 50, 55 or 60; such as: “How much weight should you lift”? “How often to train”? “What equipment to use”? “How many repetitions & sets are best to achieve optimum results”? And many others! A majority of the people after 50 take excuses to give a skip to weight training altogether. 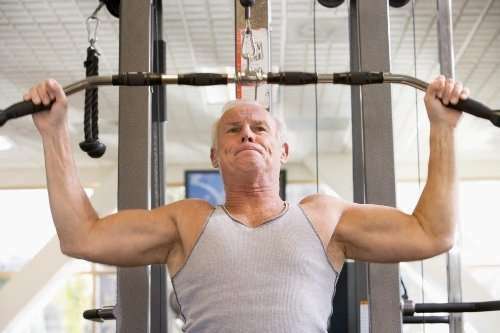 But many research studies have documented benefits of doing weight training after 50 or even 60. Actually health & fitness professionals highly recommend doing it even after 60. A lack of weight or strength training leads to risks of rapid muscle loss (known as sarcopenia), as you age. The risk of falls also increases and your metabolism rate slows down (muscle burns calories at rest). There are several research studies to support the fact that upon turning 40, women’s risk of heart disease equals that of men. Plus, hormonal changes can speedily cause corrosion of bone density, increase in belly fat, and the depletion of calorie-burning muscle tissues. Weight training improves bone density, strengthens bones, and increases muscle mass leading to greater burning of fat. Undoubtedly, men too benefit. In a study done by Harvard School of Public Health, the men who did weight training for just 20 minutes daily suffered less of an increase in age-related belly fat than the men who were doing aerobic activities for the same amount of time. Find here a guide to the most asked questions pertaining to weight training after 50, especially at mid-life, and useful tips to get started safely and effectively. The following guidelines relates to healthy adults without any medical issues. If you have any medical problem, talk to your doctor prior to starting any new exercise program. (i) If you are prescribed rehab exercises by a physical therapist for a particular problem, go as per his/her instructions. (ii) Some people over 60 may not like to strain. Generally the traditional standards for weight training involves 3 to 5 sets of 8 to 12 repetitions, but “that may not hold true for boomers. Moreover, heavy resistance (too many number of sets & reps) can cause spine and knee problems. There’s no simple formula to ascertain how many days a week should you weight train. The answer can be entirely different for person to person. If you’re aiming to pep up your fitness level, your magic number of “how many days a week” depends on how active you already are. The beginners can probably see results from once or twice day-week workout – at least for the first month. After that, you should aim to gradually progress to 3 to 4 times a week. The magic number varies depending on your fitness level & specific goal, but in general, 4 to 5 days a week can be done if you’re want to improve your fitness level and remain in shape. Weight training generally needs a day’s rest in between to let muscles recover. According to The National Strength and Conditioning Association (NSCA) recommendations, one should allow a recovery time of 48 to 72 between exercise sessions. But, if you want to train more than 4 times a week, make sure to spread out the muscle groups and body parts on different days. For instance, work on your chest one day and arms another, etc. How Do You Know When It’s Time To Increase Weight/Resistance? (i) Once you are able to do 15 to 20 reps properly using a weight without pain then you can increase weight. (ii) For larger muscle groups, like legs, increase weight by ten percent at a time. But for smaller muscles, such as arms and shoulders, only raise resistance by 5 percent at a time. What’s best: Dumbbells, Tubing, Kettlebells or Other Resistance? Any of these methods work. You just need to use the resistance that is appropriate for the muscle groups you are working on and in accordance with your ability to control it. For instance, dumbbell chest press (lying on your back and pressing up dumbbells towards ceiling) works on almost the same muscles as tubing chest press (you stand, anchor fitness tubing in a door hinge, and then pressing handles in towards the center). But if you are a senior/beginner the tubing method may be easier to control. You can try a few different resistance devices to find one that works best for you. If you feel a need you may talk to an experienced trainer to help you start a type of workout that you’ve never done before. For example, do not just start swinging kettlebells without first understanding the technique that’s needed to keep a control over them. If you are thinking of starting weight training and have any question or apprehension in your mind please ask under the comments section below.